Fall is here and many children and youth are back at school! As the seasons change, we welcome this opportunity to consider the the needs of you - parents, caregivers, teachers, therapists, social workers and others who give their best to children and youth with special needs. Caregivers who pay attention to their own physical and emotional health are better able to handle the challenges of supporting someone with special needs. Parents and caregivers who care for themselves are better able to care for others. Emotionally healthy caregivers adapt to changes, build strong relationships and recover from setbacks. Take a couple hours this Wednesday evening, October 7 from 6:30 - 8 pm and gain some practical stress-busting strategies with therapist Joy Koeppen. REGISTER HERE for our free Back to School: Practical Tips for Dealing with Caregiver Stress and Avoiding Burnout. The Stronger Together Youth and Young Adult peer support groups start up again Tuesday, October 6. Youth and young adults ages 14- 22 who have lived experiences in one or more service system such as special education, mental health, or family services are invited to join in these twice-monthly groups. At the same time, parents and caregivers meet with their own facilitated support group. A light dinner is served to all participants and the groups are free of charge, thanks to support from YouthMOVE Virginia at NAMI of Virginia and Fairfax County's System of Care. Learn more and register HERE .We look forward to seeing returning families as well as brand new ones! Raising a Child with Prenatal Exposure, TBI, Autism or Developmental Delays? Come learn about trauma, how to address it at home and school and get a treat at our Trauma Awareness Training for Families and Professional Partners on October 27. Bring your favorite education, social service, counseling or other professional with you to this free training and you both go home with a Panera gift card! 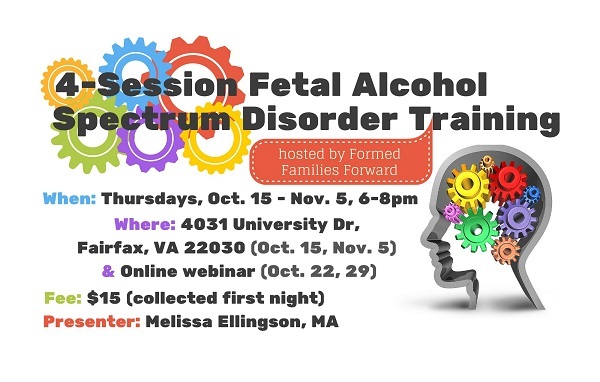 Learn the basic signs of trauma and how to respond at home and in the classroom with experts from the Trauma Informed Care Team of the Partnership for A Healthier Fairfax. Share your experiences at a Parent/Caregiver Focus Group session with Virginia’s Department of Medical Services (DMAS) to discuss Residential Treatment Services for children and adolescents. DMAS is interested in finding out from parents what their experiences have been with RTS and/or what questions they have about how to obtain RTS for their youth. Susan Clare, Special Advisor for Children’s Behavioral Services, DMAS, will lead the session. The focus group in Northern Virginia will be held on October 20th at 1:00 pm at Formed Families Forward's building, 4031 University Dr., Fairfax VA 22030, Please RSVP. Q: Now that the kids are back at school, I feel more stressed than ever. We get calls and emails from the school about their behavior. Then there are the homework battles. I feel like I am losing it! Any suggestions for managing the challenges of back-to-school stress? A: We at Formed Families Forward - Board members, staff and volunteers alike - completely "get" this question! Raising children and youth with special needs is a special kind of challenge! Research is pretty clear that parents and caregivers of children with disablities are at higher risk of stress-induced health issues. Moreover, because many of the children in our care have experienced trauma,we may feel stress resulting from helping or wanting to help a traumatized or suffering person. This is often called secondary trauma. If we are not in good emotional or physical health, we cannot give our best to our families. So take a moment, carve out a little time and choose an activity or two off this list and do it for yourself and for those in your care. Regress! Do something you loved to do as a kid. Run through the sprinklers, hang from the monkey bars, or color a picture. Take a Risk! Do something you've always wanted to do. Bake or cook a new dish. Try a new sport. Take a class (there are many online learning options) or find a group of others with the same interest. Laugh! Watch or listen to a comedy video, podcast, or website. Find a great joke. Touch!. A therapeutic massage can relieve muscle tension, stimulate the body's natural painkillers and boost your immune system. Take a Nature Break. Get outside if you can. Walking in - or even just looking at - nature calms our nerves and relieves mental fatigue. Find additional suggestions from NAMI and Mental Health America. Remember if behaviors are becoming a big issue at school, there are assessments and interventions that can support children with disabilities and their teachers, Call or email us and we can help! Nothing Scary about these Trainings and Events! October features a spook-tacular selection of trainings and events sponsored by other organizations and agencies, around the region and state. October 17 - ADHD Connection: Perspectives on Self, Family and Community, hosted by CHADD and the ADHD Resource Group of Northern Virginia, at Argosy University, Arlington. Use discount code MEET20 before 10/11 for 20% off. October 21 - Understanding the IEP Process, hosted by Alexandria City Public Schools Family Resource Center. October 22 - You and The Affordable Care Act: What it means and how you can benefit? Project LIFE session for youth in foster care, Alexandria. November 7 - Circle of Support conference, hosted by The Arc of Greater Prince William, Woodbridge. November 13-15 - Project LIFE Youth Conference for foster youth and young adults, Bristol. Learning disabilities or LD is a term that includes a variety of auditory, visual, verbal and nonverbal processing disorders. The disorders are brain-based and can seriously impact a person's ability to read, write, and calculate.Dyslexia is a specific type of LD that impacts reading and language processing. LD is the most commonly identified disability category of students who receive special education and related services. Learn more about LD Awareness month HERE. Find great LD resources for families and educators at LD Online. Find out what Decoding Dyslexia Virginia is doing to advocate for students with dyslexia and their families. Register for the October 24 AIM (accessible instructional materials) for Success mini-conference at GMU Prince William campus. Learn more about interventions for dyslexia at the Fairfax County Public School Parent Resource Center's Strategies to Support Secondary Students with Dyslexia on October 20 and Strategies to Support Elementary Students with Dyslexia on November 13. Every day, we post new resources and our latest news on Facebook and Twitter daily. Like us and follow us and get your FFF treats first! The Foster/Adoption book club meets October 22, 10 am at UMFS offices in Alexandria. 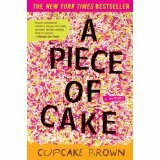 This month's book is 'A Piece of Cake' by Cupcake Brown. Learn more HERE.